My GSD is getting sicker by the day, Pancreatic Insufficiency and now hip Dyspepsia (maybe).This is what my vet and his specialist are saying. Do you know a vet that specifies in GSD so I can send him/her the tests results and get a third opinion on GSD disorders and the new treatments for the disorders and diseases? My Vet says a friend of his has two GSD that have gone down the same road that my dog is going. I am not for sure about his diagnosis and treatment. Comments for Can Anyone Suggest a knowledgeable German Shepherd Veterinarian? Please go to the Prozyme website to read about this product. It is a plant enzyme and with dogs that have EPI it is my understanding that they need an animal enzyme for digestion with this disorder. Always check with your vet before taking advice on what worked for someone else. EPI can be a serious disorder for your dog if not handled properly. My two year old GSD has EPI and is doing very well with "Prozyme" which I get from my vet for approximately $22.00 the bottle lasts for about one month. You only have to add 1/4 teaspoon for every cup of food. Helps them digest their food. As for Hip Dysplasia, call the veterinary college in your state. They will be most knowledgeable but could also recommend a vet closer to your home. My GSD Gusta has had EPI for 5 years now. She is on a weight control diet with low fat , protein and fiber. To her food I add a pancreatic enzyme called Viokase-V which is of porcine origin as her pancreas is insufficient in digestion. Monthly she receives a B12 shot and periodically she is put on an antibiotic to clean the colon as bacteria builds up. She's doing great, looks terrific, and is full of energy. My Vet checks her out every few months to make sure. I found with Gusta that the fat content in the food made a huge difference when it was lowered. Her diet consists of 20% protein, 7%fat and 8% fiber. Its something that GSD's can live with and do very well once you get them going in the right direction. Good luck! 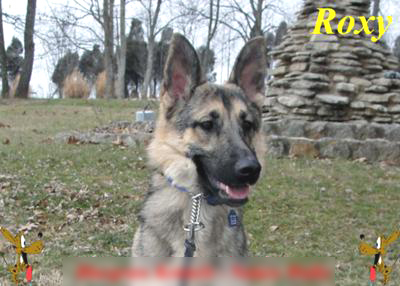 I assume your GSD is AKC registered... AKC website has a link that offers vet listings. I hope this help you find your second or third oppinion. Vetri-Science Laboratories makes a wonderful product called Glyco-Flex Stage I, II, or III. It will take a few months to see an improvement in your dog but it is a wonderful joint support and has helped some of my dogs as they age. You might also want to talk to your vet about an anti-inflammatory such as deramax , previcox or rimadyl to make the dog more comfortable while you're trying to find out what kind of issues it has. My dog Gusta was diagnosed with EPI at age 2, now 7. She is fed Healthwise weight control with 20%protein, 7%fat, 6%fiber made by Natura. To that I ad Viokase-V. Monthly she recieves a B12 injection and periodically she is treated with an antibotic to cleanse the colon as bacteria builds up from the disease. She's is doing great. They seem to be unable to digest fat with this disorder so its important to learn to read labels. Its a predisposed disorder in German Shepards but is manageable and your dog can live a long normal life with you being aware of his or her needs.